While there is so much work to do, the distractions of the garden are so tempting. 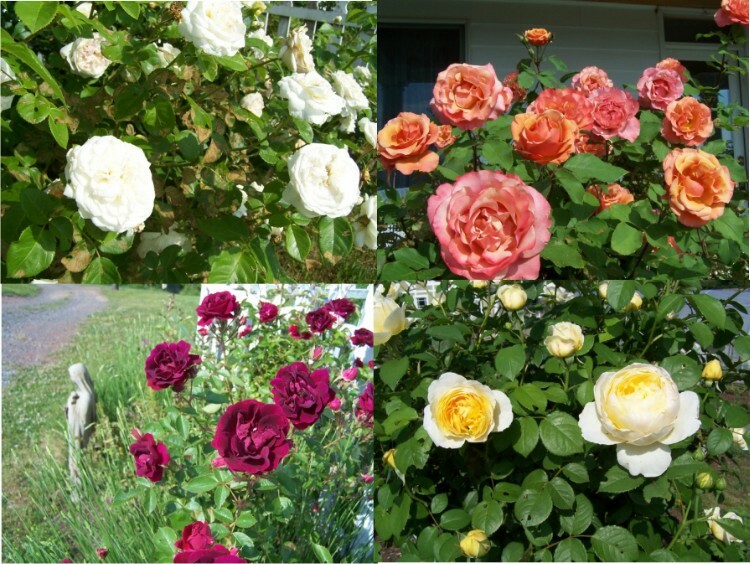 Only a few weeks ago, most of the landscape was starting to green up, and now the roses have exploded in bursts of color and fragrance. Many of the roses here are David Austin Roses that I have selected for their old world appearance and fragrance, especially next to the front porch where we can enjoy their decadent scent. A small Carolina Wren couple has made a nest in the tree rose and the babies are almost ready to fledge. It’s easy to forget trials in so much beauty. What work? Since we do not use pesticides on our roses, they are available to eat as well. A few petals are so lovely and delicious tossed into a salad. 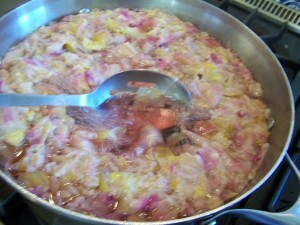 Today, however, I am going to demonstrate how to make Rose Petal Jelly. 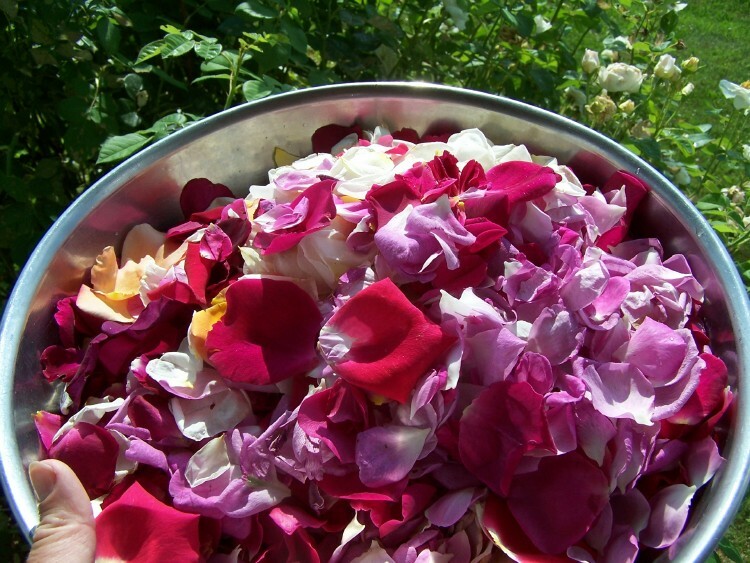 Using a large stainless bowl, gather petals from your pesticide-free garden. I don’t recommend using sprayed petals. Here I picked an assortment from the garden, filling the 13 inch bowl. If you’d like the deep red color to you jelly, concentrate on getting fuchsia, red and burgundy roses. Our white roses are the most fragrant and so I add lots of those for flavor. 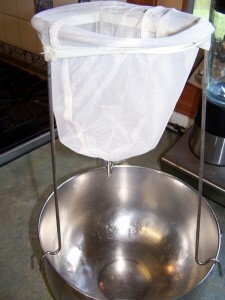 Rinse rose petals in a sieve and place them in a large pot. Fill the pot with water to cover. I have used approximately 13-14 cups. 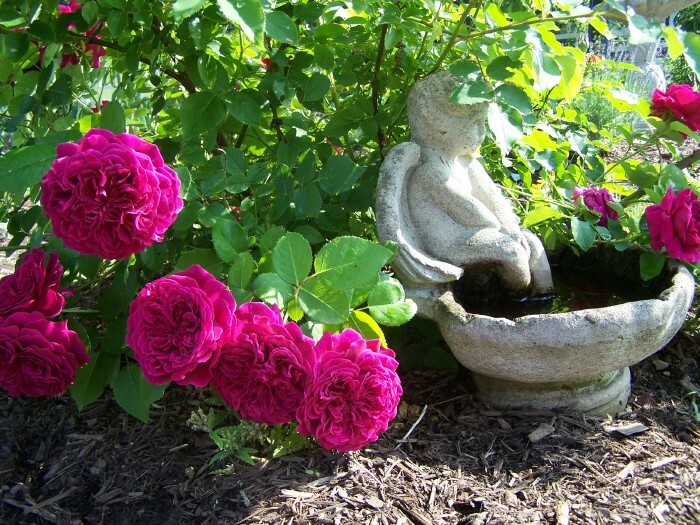 Bring these to a boil stirring often since the roses petals will want to float at the surface at first. Boil until they have lost their bright hue and most of the color and scent has transferred to the water – approximately 10-15 minutes. The darker petals will give up most of their color, appearing pale like this below. I have decided I’d like a darker color so I added more dark petals after this photo, bring the water back to a boil to extract their color. Add the juice of two lemons. You will notice the juice livens up the color of the water, brightening it. The acid from the lemons will be necessary for the pectin to work. Pour the petals and water through a jelly bag strainer. For convenience, I am placing one in my Amazon store, along with some other items you may need for canning such as my favorite Italian and German canning jars. Now, measure your liquid back into a pot. For every cup of liquid, I will use one cup of sugar. Sounds like a lot, but its standard. 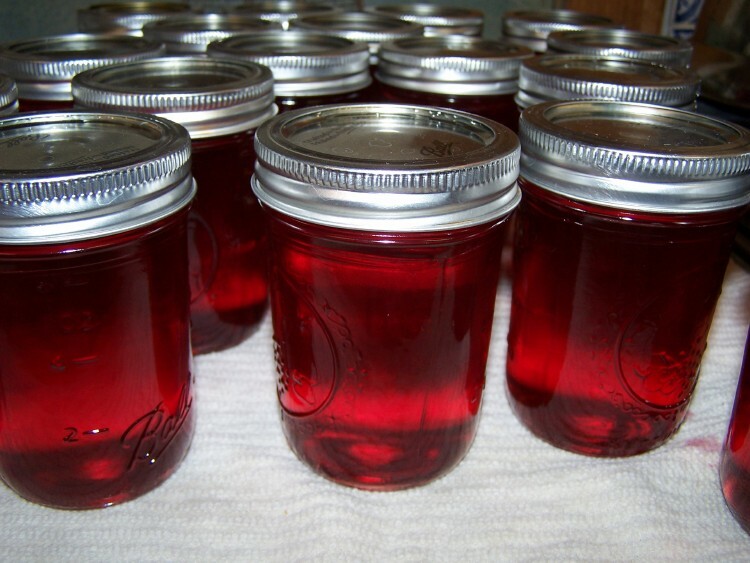 This is one of the few times I use refined white sugar, since it won’t change the color of the jelly. Bring the rose liquid and sugar to a solid rolling boil. I will hold it here until it reaches 216-217 on a jelly thermometer. Here, I add pectin according to the instructions on the pectin, which I bought bulk from the local Amish store. Please read the instructions on your box, because some differ. In my case it calls for approximately 3 tablespoons per 3 3/4 cup liquid. I bring the mix back to a rolling boil for just over a minute, until I can discern the change in texture on my stainless spoon. When it is ready, it will start becoming solid on the spoon. Ladle into sterilized jars. Seal according to instructions of the canning jar/lid combination you are using. Process for five minutes in a boiling water bath, and let them cool on your counter. Enjoy its beautiful color and delicate flavor on toast, English muffins or scones.